What’s the new dessert trend in Singapore? It comes from France and it’s called a crêpe. In form, it’s like a very thin, very broad pancake. Typically, crêpes are served one at a time, with various garnishes to add delicious flavour. Find out the best ways to enjoy this popular dessert. Crêpes are usually made from wheat flour if they are intended to be sweet. For savoury crêpes, the cook uses a non-wheat flour, perhaps buckwheat flour. Ingredients like eggs, milk, sugar, and salt usually end up in the batter as well, depending on the recipe. If you have never watched a crêpe being made, try to find a local eatery where they showcase the process. It’s incredibly fascinating to watch a skilled chef rapidly smoothing and spreading the crêpe batter with a trowel or special spatula. Within half a minute or so, the chef deftly flips the entire large, thin pancake completely over. It takes dexterity and practice to achieve a perfect crêpe flip. In France, crêpes may be served for breakfast, lunch, dinner, or dessert. You can find savoury crêpes filled with cheese, eggs, mushrooms, tomatoes, artichoke, or various types of meat. Once the crêpe is filled, the chef flips a bit of the edge over on either side. Sweet crêpes, the kind that are becoming popular in Singapore, usually come with a different set of fillings. Chocolate spread, fruit preserves, lemon juice, whipped cream, maple syrup, fresh sliced fruit, or custard are all popular choices. However, Singapore caterers and eateries often broaden the scope of the flavours with their own unique variations. Have you ever tried a buckwheat crêpe encrusted with salted caramel? That’s what you can find at Entre Nous Creperie in Singapore. If you want some more familiar Asian flavours, visit Creperie des Arts and try the Hokkaido scallop crêpe for your main course and a Crêpe Suzette for dessert. The Crêpe Suzette is a single large crêpe with slices of delicious orange and a scoop of mango and vanilla ice cream in the centre. Other places to find delicious crêpes are Keen On Crepes, Saybons French Food Factory, and O Comptoir. At O Comptoir, you’ll find a unique combination of classic crêpe and truffle fries. Have you heard about the “Mille Crêpe Cake”? It’s a cake that has rapidly grown in popularity in Singapore since the fall of 2015. It’s the modern-day crêpe in a brand-new form. Chefs stack many crêpes in layers upon layers, until they are the height of a cake. The resulting cake is sliced and served in all its luscious, many-layered grandeur. 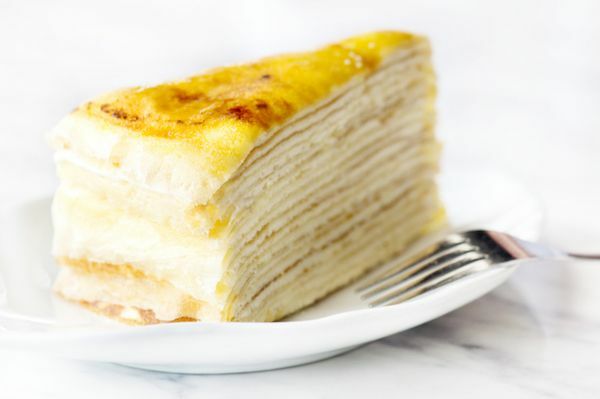 You can eat the “Mille Crêpe Cake” just like a regular cake, starting at the point of the slice and taking bite-sized forkfuls all through the layers. Alternatively, you can peel it apart, layer by layer, enjoying each layer and its filling or garnish as it comes. Try rainbow crêpe cake in multiple different colours, spread with cream between the layers and drizzled in chocolate sauce. Crepes are absolutely perfect various events from party, birthdays and even desserts for weddings. Whether you go sweet or savoury, you’ll love the thin, fragile crispness and the yummy fillings of crêpes. 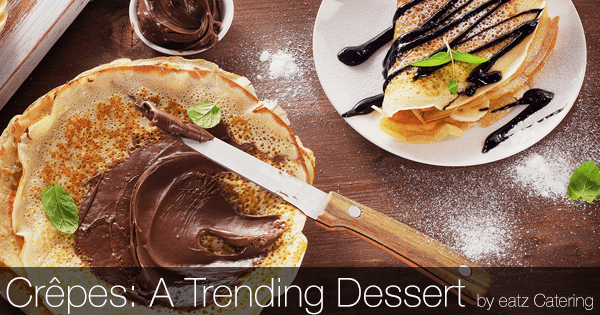 Do you know some friends and family who haven’t tried this dessert trend yet? Take them out to a local restaurant and share the joy of a new culinary discovery! If you’re interested in French food, check out some ideas for feasting like you’re in France! Is Street-Style Food a Suitable Choice for a Catered Event?